← Comprehensive Plan Meeting on April 7th. Earth Action Day is April 9th! 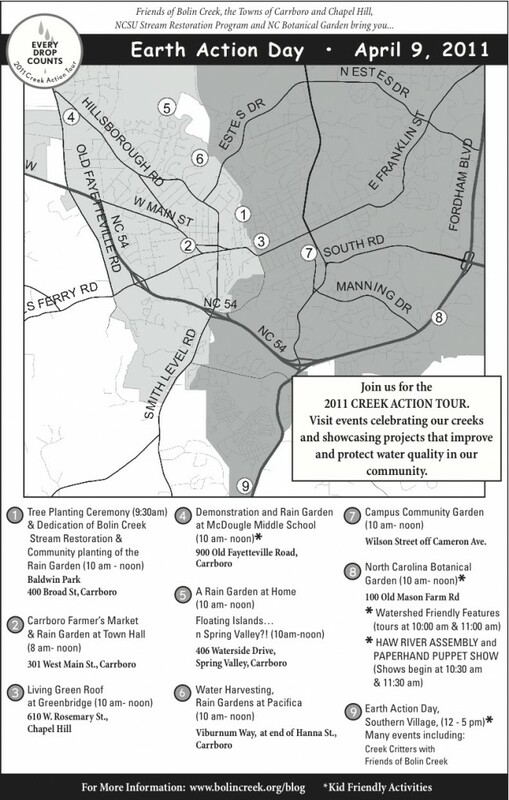 Join the 2011 Creek Action Tour organized by Friends of Bolin Creek and the Towns of Chapel Hill and Carrboro to promote healthy creeks and responsible growth. A map with complete tour information can be found at www.bolincreek.org. A small scale map is below. This year’s Creek Action Tour takes place next Saturday from 10 – 12 noon, and showcases projects that improve our water quality in our creeks, and ultimately our drinking water.You can choose from nine different free events on the Tour, including a puppet adventure at the Botanical Gardens, a demonstration rain garden at McDougle Middle School, a stream restoration project at Baldwin Park, floating islands that clean water and more. Neighbor Alex Millager designed and built a backyard rain garden. Learn how you can build one. A tree planting ceremony at 9:30 am kicks off the tour at Baldwin Park, where a large stream restoration is underway. The work done by our two towns with federal, state and North Carolina State University support to help improve Bolin Creek, an impaired stream. The project is described here. This entry was posted in 2011 Creek Action Tour, Earth Action Day, Protecting creeks and tagged Chapel Hill neighborhoods, Creek Action Tour, creek buffers, Resource Conservation District. Bookmark the permalink.